Jamaican lamb curry with rice and peas. Both recipes are from Simply Recipes. My butcher was out of goat so I substituted lamb shoulder on the bone – I had him saw it into chunks. I followed the curry recipe fairly faithfully, simply increasing the number of habaneros to 3. For Jamaican curry powder, which is made from roasted whole spices and includes allspice, mustard seed and anise in addition to the more usual Indian ingredients, I followed this recipe. My coconut milk was Aroy-D.
I’m not a huge fan of kidney beans, and I’ve read that pigeon peas are used in Jamaica, so for the rice and peas I used Sea Island Red Peas from Anson Mills. 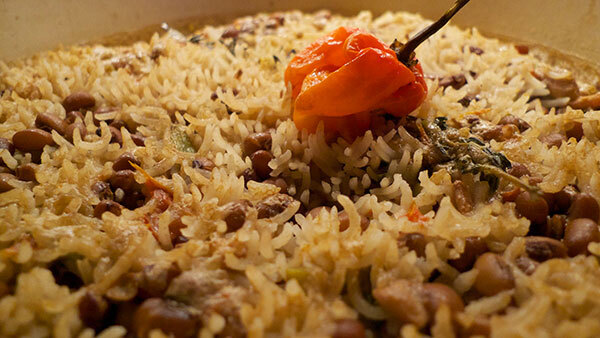 I wouldn’t pay too much attention to the hysteria surrounding the single whole habanero in the recipe linked above, but do make sure you have an extremely large pot – the peas and rice will expand enormously. For extra heat I served homemade Inner Beauty hot sauce, using Chris Schlesinger’s own recipe. It’s one of the best food things ever to come out of Boston. Eat with Dark & Stormys, Red Stripe or whatever else slakes your thirst.